Connect the Guillain-Barre syndrome (“acute, and rapidly progressive, inflammatory demyelinating polyneuropathy”) to Squalene: The Swine Flu Vaccine’s Dirty Little Secret Exposed and do some more research on squalene. The swine flu vaccine contains 1 million times more squalene according to Dr. Rima Laibow and Dr. Anders Bruun Laursen, than the vaccine considered to be responsible for the Gulf War Syndrome! Kathleen Sebelius has signed a decree in July 2009 granting vaccine makers total legal immunity from any lawsuits that result from any new “Swine Flu” vaccine. The swine flu vaccine destroys the brain and the immune system, even if there are no immediate side effects. You will find a lot more information at the end of the article. But when Detroit schools – both public and private– sent home permission slips for students to get H1N1 vaccine at school, the return rate was only about ten percent. For instance, today parents attending the Christmas program at the Foreign Language Immersion School on Outer Drive had the chance to get shots for themselves and their children before or after the program. But apparently not well enough. So Dr. Davis and his team came up with an innovative idea. They teamed up with Happy’s Pizza. And each class in the city that has a permission slip return rate of 80-percent or more will get a pizza party for the entire class. 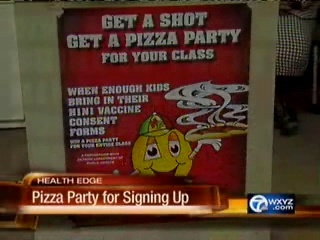 And while the kids may sign up for the pizza, the parents need to know it’s important to sign the forms because flu season isn’t over just because the number of cases have leveled off.